Burma-Shave rhyme signs, Howard Johnson’s orange roofs, KFC’s revolving chicken buckets: all pieces of modern Americana that today exist mostly in memory alone. 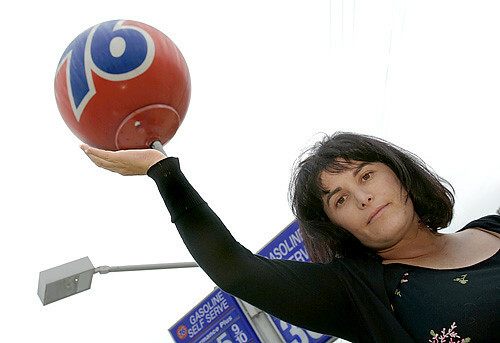 Now, the iconic orange-and-blue Union 76 gas-station ball is on its way to joining them – unless Kim Cooper can stop it. Cooper, 39, is a native Angelino and self-proclaimed "ultimate dilettante." From editing and publishing Scram, a journal of un- popular culture, to co-hosting the "1947project," a blog and bus-tour series highlighting LA’s off-the-beaten-path crime sites, "my job is rescuing the underdog from neglect and destruction," she says. According to its 2004 annual report, ConocoPhillips, which operates Conoco and Phillips gas stations, as well as 76, that year initiated a project to streamline the three brands’ marketing efforts. So while its Web site refers to the 76 logo as "a long-trusted symbol [that] means something special to our customers," its most recent graphic-standards manual calls for a brand-consistent red-and-blue color scheme, rather than the historic, eye-popping orange. "They began knocking down the 76 balls," Cooper recalls. 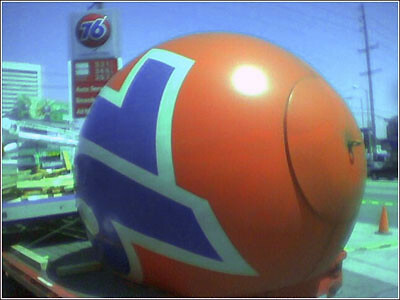 These omnipresent symbols for gasoline in many parts of the US were methodically being substituted with ground-level "monuments" or taller, disc-shaped signage. Many of the LA area’s 400 spheres have already been replaced, including the one that rose above Dodger Stadium for decades. Cooper’s endeavor has been showcased by media outlets from the LA Times to the BBC. Actor Michael Madsen even offered to help out, then asked where he could get his hands on a retired sphere. And following a Seattle radio interview, Cooper was contacted by former Young & Rubicam art director Ray Pederson – the man who designed the original ball as signage for a Union Oil Co.-sponsored sky-tram ride at the 1962 World’s Fair – who offered his enthusiastic support. "Children look for the 76 pumpkin every Halloween, and it makes them happy," she says. And the company’s ubiquitous car-antenna mini-balls, introduced in 1967, became both a promotional coup and a still-strong fad: By the late 1990s, 76 was dolling out 4 million toppers every year. Cooper admits that on some level, the effort is prank-like and "silly." She says she’s "been attacked by people for putting my energies into this rather frivolous and highly charged campaign." 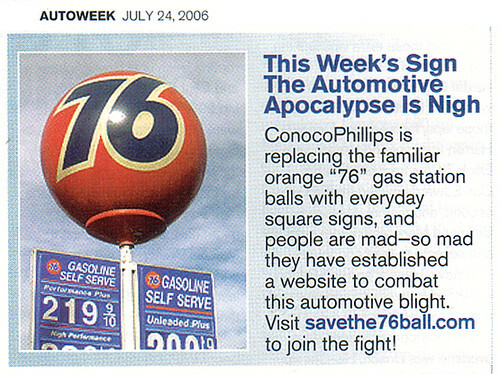 But saving the 76 sphere is about more than a gas-station sign. "If you don’t look at what’s around you, it’s very easy to not care if things get knocked down and destroyed, things that actually reflect the culture, history, and changes of your place," she explains. "I think it’s a tragedy." 76 Ball Fans in Indianapolis URGENT request! Michael Madsen wants to Save Ray’s Balls!